It's far too early to pass judgement on these new wearables, but while they're still largely pointless at this stage the direction Sony is taking – making wearable accessories more useful and attractive – is a great thing to see. Let’s get real for a moment here, guys. It’s only day three of MWC 2017, and I’m starting to flag a little bit. And I’m now at the point where I’m so tired that I'm not sure if I should be writing about a piece of metal and plastic that could have the potential to be rather useful for notifications and music on the go. Sony decided that it needed to try again though, and it’s brought out this concept, which uses the same theory but updates it into a more Blade Runner-like design. dictate messages, let you know what your phone is up to and register nods and shakes of the head as inputs. I can’t say I needed it explicitly in my life, but it’s a nice idea, and made it to market. Sony decided that it needed to try again though, and it’s brought out the Open Ear concept, which uses the same theory but updates it into a more Blade Runner-like design. The main difference to design is that it sits rather confusingly under your ear, hooking around and sitting against your ear canal. The tiny rubber donut is rather hard to put into place, and it feels like gravity is fighting against the fit the whole time.The glossy, chromed plastic is nice enough but not something you can see when the Xperia Ear open-style concept is popped on the side of your head - I really found myself wishing it had some other way to lock into place as it wasn’t going inside your ear to hold on. The weight was OK though, and if I were allowed to play around with the earpiece a little more - and take it on the road a little too - I can imagine I’d get used to the fit and convenience of what it can actually do. The thing is, I’m not entirely sure what it can, such is its level of conception at this point. I assume it can handle the main features that the Ear offers, such as being able to respond to your voice, read out messages and tell you who’s calling without the need to pick up the phone. But Sony is making much more of a big deal about the fact the Xperia Open Ear offers that functionality without blocking your ears from all sound. The rubber ring sends sound into the ear canal while maintaining the connection with the outside world. 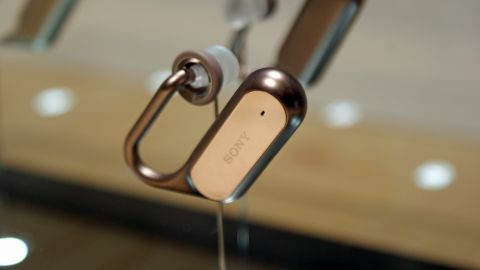 Sony is even claiming that, using its new audio conducting technology, you can both listen to music and friends in a conversation, like having your own personal elevator music wherever you go. I can see a lot wrong with that. Firstly, it’s going to be leaky if you’re not getting that sound conduction spot on - and even then, it’ll possibly be rather quiet (although I’m absolutely ready to be proved wrong on that, as I’ve not tried the audio quality yet. The second is that we don’t need more sound in our lives. We’re already overloaded with tech and tasks that the idea of switching off becomes frightening… so we pack more things into our day, and the Open Ear concept is part of that. If we’re all listening to music all day, that’s never going to be a brilliant thing; even if we can hear our friends just fine there will be a distraction running at the same time, compounding the problem. In short, I like the sound of what these ear concepts can actually do - it’s just hard to see whether they’ll be a success or not without giving them a full run down. It’s far too early to really know whether giving these concept hearables their own screen time, but they do look pretty cool. If they’re great for sport then that will go a long way to making them useful, as being able to hear music and the crowd / marshalls in a race is a must-have element for any runner that’s been nearly run over by a car or run a mile in the wrong direction with everyone screaming at them to turn around. It's worth remembering that these are a concept device though - it's not fair to say whether they're functionally gifted or not. They're an example of where Sony wants to go, and any smartphone manufacturer that's trying to break out of the 'black rectangle' mould should be applauded. Ultimately, these ear-based wearables are attractive and cool in their design - and that's enough to color me intrigued. Will the Sony Xperia Open Ear concept ever make it out of this stage and into fully-fledged product? I’ll need to do some digging to find the earpieces working - then we can pass judgement on whether or not they actually work.